The Volksgrenadier divisions were formed in the Autumn of 1944 after the destruction of Army Group Centre by the Soviet Bagration Offensive in the east and of the Fifth Panzer Army in Normandy in the west. The new infantry divisions were designed to economise on personnel and to be primarily focused on defence. These new formations combined the names Volks (People’s), to inspire a sense of nationalism and fighting spirit, and grenadier, to invoke the traditions of the German military. In an attempt to optimise their fighting power, while economising man-power, each Volkgrenadierdivision had three infantry regiments of two battalions (unlike an Infanteriedivision, which had three battalions in each regiment). To compensate the Volksgrenadier units were armed with a higher proportion of automatic weapons to create a higher volume of firepower. 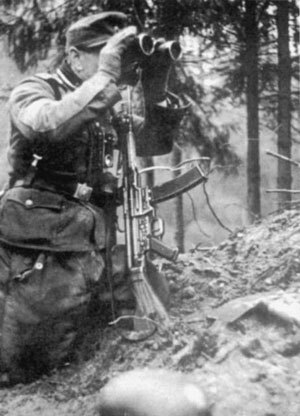 The Sturmgewehr 44 (or StG 44) assault rifle was used to arm two of platoons in each Volksgrenadierkompanie, giving them devastating firepower, but only at short ranges. They were also issued with a very large numbers of Panzerfaust anti-tank weapons, once again short-ranged, but still a powerful asset against Allied tanks. The highly efficient MG42 machine-gun still played an important role with the assault rifle armed Sturm (assault) platoons issued with two in the third squad, and three issued to the third Schützen (rifle) platoon to providing their main firepower. The division’s supporting arms also economised on personnel. The artillery was organised into larger six-gun batteries (instead of four guns) to save on the number skilled artillery specialist required in each battalion, resulting in less batteries, but usually the same number of guns or more. The Volksgrenadier divisions retained Panzerjäger (anti-tank), FlaK (Anti-aircraft), Pionier (combat engineer), and Füsilier (light infantry and recon) companies or battalions like the older Infanterie divisions. The divisions were organised around a core of veterans from the divisions destroyed in the east or west and filled out with new conscripts or excess personnel from the Luftwaffe (air force) and Kreigsmarine (navy). The mix of recruits, size of the veteran cadre, and the time new division had to form meant the performance of the divisions varied considerably. 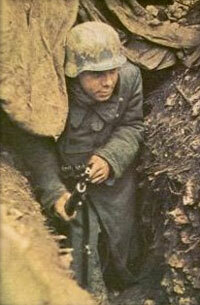 However, the Volksgrenadier divisions played a vital role in the defence of Germany through 1944 and 1945. 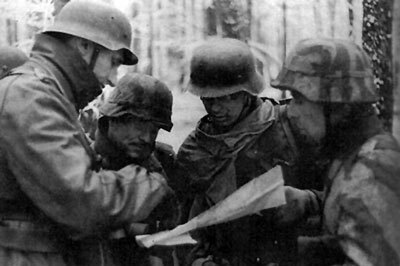 You can field a Volksgrenadierkompanie from The Ardennes Offensive, pages 150 to 158. The original 9. Infanteriedivision was destroyed in Romania after the Red Army breakthrough of the defences on Romania’s frontier. 9. Volksgrenadierdivision was formed on 13 October 1944 in Denmark by renumbering the 584. Volksgrenadierdivision. It was commanded by Oberst Werner Kolb. The division was still under-strength when it arrived at the front on 19 December. It was immediately put into the reserve. It was committed to the Ardennes offensive on 22 December, but it took more than a week to it to work its way to its assigned location near Wiltz, southeast of Bastogne. The division went into action at Nothum on 30 December and played its part in delaying the American advance toward Wiltz. On 2 January they halted the US 328th Infantry Regiment and gave some relief to 5. 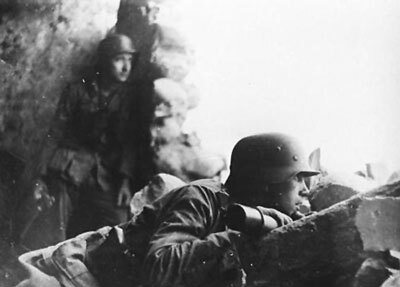 Fallschirmjägerdivision in the Harlange Pocket. 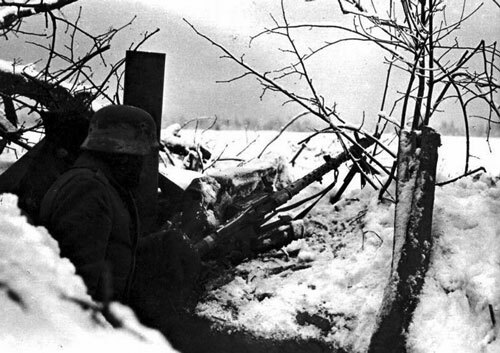 However, by mid-January all across the front the Germans were forced to withdraw and 9. Volksgrenadierdivision were on the eastern side of the Our River. By March 1945 the division was down to just the divisional staff and a few remnant units and they were taken over by 352. Volksgrenadierdivision. The 12. Volksgrenadierdivision was rated one of the best German infantry divisions to fight in the Ardennes offensive. They were assigned the role of punching through the defences on Rollbahn C, through Büllingen towards Malmedy, clearing the way for Kampfgruppe ‘Kuhlmann’ of the 12. SS-Panzerdivision ‘Hitler Jugend’. The division has its origins in the 12. Infanteriedivision formed in Mecklenburg. This division fought in Poland, France and Russia. It became surrounded at Minsk in July 1944 and was forced to surrender. Those remnants of the divisions that survived the capture of Minsk were used to form the 12. Volksgrenadierdivision, which entered combat at Aachen in October 1944, as the Allies approached the German border. They were redirected to take part in the Ardennes offensive in December 1944. They were commanded by Generalmajor Gerhard Engel who had previously been one of Hitler’s military aids. The division’s own armour was limited, with only six StuG IV assault guns available from the Panzerjäger Abteilung, so the 217. Sturmpanzer Abteilung (which itself only had eight Brummbär assault tanks) was assigned to them for the offensive. 12. Volksgrenadier division’s battle began a 0700 hours on 16 December, following a heavy artillery bombardment of the US lines. They were halted at Dom Bütgenbach on 21 December and that night supporting 12. 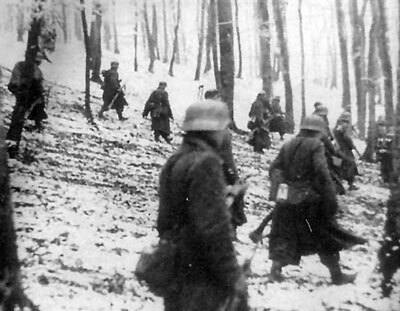 SS-Panzerdivision troops withdrew from the line, leaving 12. Volksgrenadierdivision to hold. After the Ardennes 12. Volksgrenadierdivision remained fighting in the west, taking part in the fighting for the Rur River line against the US Ninth Army. They ended the war just a remnant of the unit it had been, holding out to the last in the Ruhr Pocket in mid-April 1945. 16. Volksgrenadierdivision was formed on 9 October 1944 from the remnants of the 16. Luftwaffefelddivision and 158. Reservedivision. In October 1944 the division moved into the Vosges region and participated in the defensive fighting between Langres and Epinal. Unterrixingen and into the area of Tübingen. Here the division was finally broken in combat in April 1945, and on 21 April 1945 the divisions was official dissolved. 18. Volksgrenadierdivision gained two of the most significant victories of the Ardennes campaign by utterly defeating the US 106th Infantry Division and taking St. Vith. The division was formed in Denmark in September 1944, combining 571. Volksgrenadierdivision and elements of 18. Luftwaffenfelddivision. They were commanded by Oberst Günther Hoffmann-Schönborn. The division began its attack in the Ardennes on 16 December 1944. They pushed into the Losheim Gap through the Schnee Eifel, inflicting on the US 106th Infantry Division the worst defeat suffered by US forces in Europe when they captured over 8,000 prisoners. On 21 December, 294. Volksgrenadierregiment, 18. Volksgrenadierdivision captured St. Vith. The regiment assaulted the Prumerberg heights, punched a hole through the lines of the dug-in infantry of CCB, 7th Armored Division, and advanced down the road into St. Vith. They were soon followed by Volksgrenadiers from 62. VGD. The taking of St. Vith then allowed the Fuhrer Begleit Brigade to pursue the retreating Americans. As the Ardennes offensive ran down the division went on to the defensive. The division slowly retreated through Germany until the end of the war, when it surrendered. 19. Volksgrenadierdivision was formed from remnants of the 19. Luftwaffen-Sturm-Division (19th Air Force Storm Division) in October 1944. After the formation it was moved into the Saar-Palatinate region where the division fought until March 1945. On 31 December 1944 is took part in Operation Nordwind, anchoring the Western flank of the Sturmgruppe 1 (Assault group 1), while the 36. Volksgrenadierdivision and 17. SS-Panzergrenadierdivision attacked into the Sarre Valley against the US 44th and 100th Infantry Divisions. However, with little progress in this sector the assault was called off on 3 January 1945. As the Allied counter-offensive against Operation Nordwind gained ground they were pushed by the US 44th Infantry Division. They fought alongside in February, then absorbed in March, the 340. Volksgrenadierdivision. The division was disbanded on 26 March 1945 in Waldangelloch, Bavaria, Germany and units were parcelled out to reinforce other units. 26. Volksgrenadierdivision formed in September 1944 from remnants of the veteran 26. Infanteriedivision and the partially formed 582. Volksgrenadierdivision. The division was filled out with Luftwaffe and Kriegsmarine replacements. The task set for 26. Volksgrenadierdivision for the Ardennes offensive was tough. They had to cross the Our River, fight their way up its steep western bank, and break through the US lines around Bastogne. In their path lay hundreds of felled trees, copious barbed wire entanglements and large areas of mines, all left behind by retreating German troops earlier in the year. They had to penetrate all of these obstacles and punch through the American lines, thus clearing the way for 2. Panzerdivision and Panzer Lehr Division to push through towards their objectives further behind the American lines. Under the command of Oberst Heinz Kokott, they attacked the US 110th Infantry Regiment of the 28th Infantry Division on 16 December. The American riflemen had deployed along ‘Skyline Drive’, a ridge running behind the Our River between St Vith and Diekirch. The division quickly pushed through to the villages of Marnach, Hosingen and Holzthum. At Hosingen they met III Battalion of the 110th Infantry Regiment, whose K Company, as well as B Company of the 103rd Engineer Combat Battalion, held the village. The village held access to the good road leading west towards Bastogne and over the Clerf River. 77. 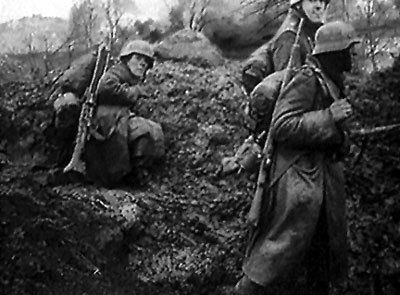 Volksgrenadierregiment led the assault towards Hosingen, while 39. Füsilierregiment pushed along the narrower road to the south towards Holzthum. On reaching Hosingen I Battalion, 77. Volksgrenadierregiment was hit with heavy fire and swung around to the north to continue on to Drauffelt. The following II Battalion immediately assaulted Hosingen, but the two American companies were well dug-in and the assault devolved into a series of close range fights, with many hand-to-hand clashes, lasting throughout the day. I Battalion, 77. Volksgrenadierregiment continued on to Drauffelt, coming under artillery fire from Buchholz, forcing them to swing north again. They finally captured the bridge over the Clerf River in the early hours of 17 December. Oberst Kokott also committed 78. Volksgrenadierregiment. Its II Battalion seized the crossing at Wilwerwiltz, while I Battalion joined the assault on Hosingen with some of the division’s Hetzer tank-hunters. The defenders finally surrendered on 17 December. Similar determined defence was encountered at Holzthum and Consthum, both also falling on 17 December. The division reached the outlying Bastogne defences at Neffe and Bizory by 19 December. This allowed the two panzer divisions following the Volksgrenadierdivision to bypass Bastogne to the east and west. However, by this time the American 101st Airborne Division had arrived to take over the defence of Bastogne from the shattered 28th Infantry Division. These elite airborne troops would prove tough to shift. Between 19 and 22 December 26. Volksgrenadierdivision made several attempts to breach the American perimeter to no avail. However, they did have the Americans surrounded. The division spent January attempting to break into the paratrooper stronghold, before being forced to fall back when faced with Patton’s counter-offensive in February. The division’s lines were finally broken when the Americans crossed the Pruem River. However, the division fought on until they had just a few hundred men left. With their escape route cut by American armoured troops, they finally surrendered just west of the Rhine River in March 1945. The original 36. Infanteriedivision was formed in 1936. It took part in the invasion of France in 1940 and of the Soviet Union in 1941. The division was destroyed at Bobruysk in June 1944 during the Soviet summer Bagration Offensive. It was reformed from the remnants of the 268. Infanteriedivision in August 1944 as 36. Grenadierdivision and renamed 36. Volksgrenadierdivision in October 1944. The new division was sent westwards to defend France, Luxembourg and the Saarland from Allied advances and entered combat on 10 September on the Moselle River north of Metz. The Germans pulled back to the Franco-German border and by November the division had worn itself out in the two months of hard fighting. The division took part in Operation Nordwind in January 1945, under the XIII SS-Korps. By now the division was reduced to the size of a single regiment, though its morale remained good, it made some gains before the advance was called off in its sector after the failure of 17. SS-Panzergrenadierdivision to its left. At the beginning of the Allied offensive against the Rhineland in 1945 it was forced to abandon positions south of Saarlautern (Saarlouis). It retreated to the Rhine north of Worms, and then through northern Württemberg to Aschaffenburg. There, a last line of defence was established. In April 1945 the last the remnants of the division withdrew to Upper Bavaria. In Traunstein and Teisendorf these final elements of the division surrendered to the Americans. The division was formed in Aarhus, Denmark in September 1944 as a replacement for the destroyed 47. Infanteriedivision by redesignating 577. Volksgrenadierdivision. In addition, the remnants of 47. Infanteriedivision were incorporated. It was commanded by Generalleutnant Max Bork. In mid-November, the division was ordered just east of the village of Gressnich, now part of Stolberg in North Rhine-Westphalia. In December 1944, the division moved into the area of Aachen and took part in the defensive battles of 5. Panzeramee. 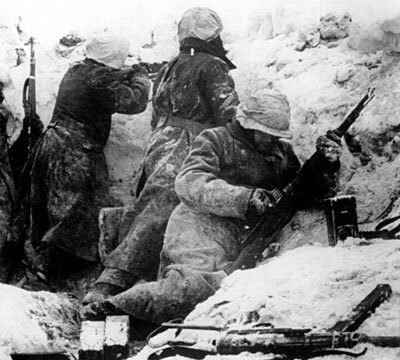 In January the division took part in the Nordwind Offensive, relieving 21. Panzerdivision and 25. Panzergrenadierdivisions after they had taken the towns of Rittershoffen and Hatten on the Maginot Line. By February 1945 the division took up positions around Bitschoffen in Alsace. From here, the fighting retreat to the east of the Rhine began. Between Germersheim and Speyer, the division would continue to withdraw east. In April 1945 the division was broken up. Combat units fought their way back to the Enz, others have been pushed up to the Tyrol, where they fell into American captivity. 62. Volksgrenadierdivision was formed from the veteran 62. Infanteriedivision reinforced with the forming 583. Volksgrenadierdivision. 62. 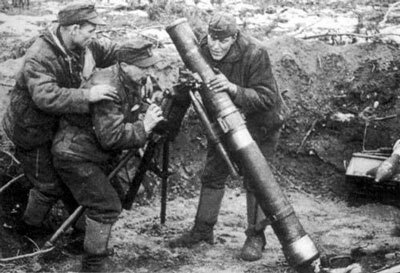 Infanteriedivision had seen extensive service on the Eastern Front during 1942, 1943 and 1944. At the beginning of the Ardennes offensive the division was allocated to the LXVI Panzerkorps where it fought alongside 18. Volksgrenadierdivision, 560. Volksgrenadierdivision and 116. Panzerdivision. The divisions assaulted towards Winterspelt on 16 December and the following day had reached the high ground overlooking the river Our, and the railway line and crossroads at Steinebrück, pushing their way through the US 424th Regiment, 106th Infantry Division with little resistance. Here the resistance stiffened an they came under counterattacks from the US 9th Armored Division’s CCB. With only their own 14 Hetzer tank-hunters in support there was little they could do to punch the armoured troops out and the Americans blew up the Steinebrück bridge. However, by 19 December, the division had reached Lommersweiler and Setz, making contact with 18. Volksgrenadierdivision. 62. VGD joined the other division’s assault on St. Vith and followed up the retreating US 7th Armored Division on 23 December. They advanced as far as Salmchâteau. Heavy fighting continued in the sector for three weeks until the division was relieved by 326. 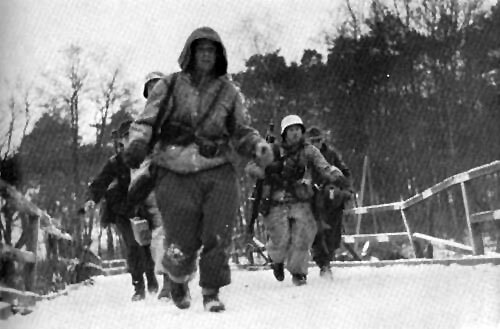 Volksgrenadierdivision in mid-January 1945. After the Ardennes, 62. Volksgrenadierdivision retreated into the Ruhr Pocket where it was destroyed in April 1945. The 79. Volksgrenadierdivision was formed in Poland in October 1944. It was the third infantry division with that number, the previous two 79. Infanterie divisions had been destroyed on the Eastern Front, the first in Stalingrad, and the second in Romania when the Red Army overran the Axis defences in August 1944. The new division was commanded by Oberst Alios Weber, a veteran regimental commander from 7. Infanteriedivision. It moved west in December to take part in the Ardennes offensive, but was still only at about half-strength. The guns of their artillery had become tangled in traffic as they arrived at the front and was far behind them. Luckily they were able to utilise a battalion of artillery abandoned by 5. Fallschirmjägerdivision due to lack of transport, by using their own horses. During their attack on Heiderscheid on Christmas Eve they were supported by mixed tanks from the Fuhrer Grenadier Brigade. Their attack almost succeeded. However, a well timed American artillery barrage caught many of the Volksgrenadiers in the open and they were forced to retire. In the following day the repelled several attacks by the US 80th Infantry Division, forcing the American to call off their attack. The Americans began their full scale counter-offensive on 3 January and the 80th Infantry Division once more assaulted 79. Volksgrenadierdivision’s positions. The Germans eventually began a general withdrawal across the Our River on 8 January. With just 400 men 79. Volksgrenadierdivision held a pocket open at Viaden that allowed many men of the Fifth and Seventh Armies to cross the Our River. After absorbing the remnants of 276. Volksgrenadierdivision they fought around Bitburg in February, but it was finally dissolved in March 1945. 167. Volksgrenadierdivision was formed from remnants of Infantry Regiments from 15. Armee and 17. Luftwaffenfelddivision in late September 1944. The newly formed division was is Hungary from October to November 1944. It then moved to Slovakia until December 1944. It transferred from Slovakia to the Western Front for the Ardennes offensive (Battle of the Bulge). The division wasn’t released from OKW Reserve until 22 December and did not arrive near Bastogne until 28 December. 167. Volksgrenadierdivision along with the battered remains of 1. SS-Panzerdivision were ordered to take Bastogne ‘at all costs’. The attack against the reinforced town was ineffective and the 167. Volksgrenadierdivision began a slow retreat back to Western Germany before capitulating in the Ruhr Pocket in late April of 1945. 212. Volksgrenadierdivision was formed from the remnants of the veteran 212. Infanteriedivision. The 212. Infanteriedivision was destroyed in August 1944 in Lithuania and these survivors were combined with the 578. Volksgrenadierdivision at Schieratz in Poland. Keeping with the make-up of the original division most of the personnel were from Bavaria and were most young men, many of who were just seventeen years old. In November 1944 the division was moved west and joined the Seventh Army across the Sauer from Echternach. It was commanded by Generalleutnant Franz Sensfuss. It was at full-strength and its morale was high. However, like many of the other Volksgrenadierdivision is only had a portion of it armoured vehicle allocation. Just five StuG assault guns were available. It also only had two of its three infantry regiments available at the start of the Ardennes offensive as the third had been put in the Seventh Army reserve. The initial attacks on 16 December 1944 went well from Echternach towards Berdorf, Dickweiler and Osweiler. The Volksgrenadiers were well behind the American lines before the command of the US 4th Infantry Division were able to react. Echternach was finally taken on 17 December after Sensfuss personally led an assault by the 212. Füsilier Bataillon. 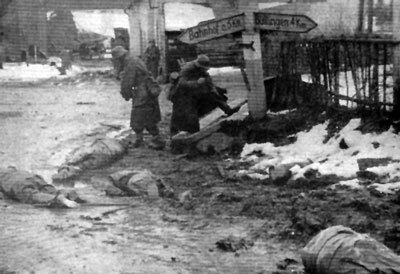 The division also took Berdorf the same day, forcing a task force of the US 10th Armored Division out of the village after bitter fighting. As more units of Patton’s US Third Army began to arrive the Volksgrenadiers were forced over to the defence. They hung on to their gains, but were eventually forced to retire and were back on their start positions by the end of January 1945. However, even with companies reduced to 25 to 30 men they continued to fight stubbornly. They defended the West Wall in February against Patton’s forces. The small kampfgruppe they had become didn’t surrender until May 1945 in Baumholder, Bavaria. The new division was formed from the survivors of the Eastern Front veterans of 246. Infanteriedivision, Kriegsmarine sailors and volksdeutsch Bohemians in Prague. They were quickly readied for action by their commander, Oberst Gerhard Wilck, and shipped to eastern France at the end of September 1944. In October 1944 they relieved 116. Panzerdivision at Aachen. They became besieged and were engaged in heavy street fighting between 13 and 21 October. They division was finally forced to surrender the city, but surprisingly managed to extract a significant proportion of its men. To make up for it casualties from Aachen it absorbed the remnants of the 49. Infanteriedivision. They were a new commander, Oberst Peter Körte and prepared for the Ardennes offensive. However, during November they became heavy involved in the battle for Hürtgen Forest and were unable to extract themselves from the battle. By the beginning of December they had been worn down by a month of hard fighting and were withdraw to once more receive a wave of reinforcement, this time untrained Luftwaffe ground crew. In January 1945 they were held in the reserve for possible use in a last ditch attempt to take Bastogne, but were never used. Once the US Third Army broke through at Pruem, the division was force on to the defence and conducted a fighting withdrawal through the Schnee Eifel region in March 1945. It finally surrenders after it commander was killed south of the Mosel River. 256. Volksgrenadierdivision was formed on 17 September 1944 as a replacement for 256. Infanteriedivision. The process began with the renaming of 568. Volksgrenadierdivision, which was forming at the military training area in Königsbrück. On 25 September 1944, the division was moved to Groningen for further training. From October 1944 the division was added to the reserve of the Army Group B in the Tilburg area. The first deployment of the division took place in the area between Turnhout and Hertogenbosch to south of Tilburg with the 15th Army against the attacking 2nd British Army and 1st Canadian Army. By 8 November the troops of the 15th Army has been forced back across the Waal. On 18 November was the division withdrawn from the front and was moved by rail to Haguenau. The new positions were about 5 km south Haguenau. After an unsuccessful attack toward the Saverne the division was put on to the defensive. 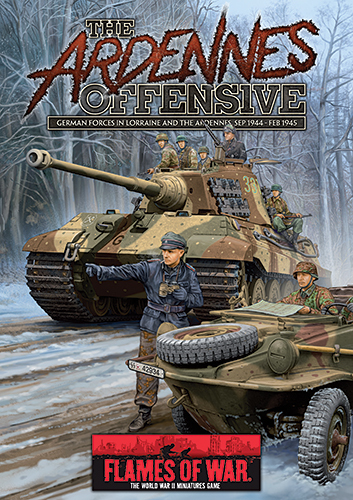 At the end of December the Ardennes offensive had not produced the hoped-for results of the German High Command, so a new offensive in northern Alsace, Operation Nordwind, was launched. For Nordwind, 256. Volksgrenadierdivision was moved to the area of Ludwigswinkel between 28 and 31 December. On 31 December at 23.00 hours the division attacked. In the following days they advanced slowly, but eventually took the heights north of Lichtenberg. During the offensive the division took heavy casualties and by 26 January only a small rump of the division remained. On 16 February the Americans began a counter-offensive. The Americans broke through the Germans lines between 27 and 28 February towards Trier and Lampaden. In early March the left bank of the Saar was evacuated by the Germans. On 7 March, the division was pushed back across to the Ruwer River, and their front begins to break-up. 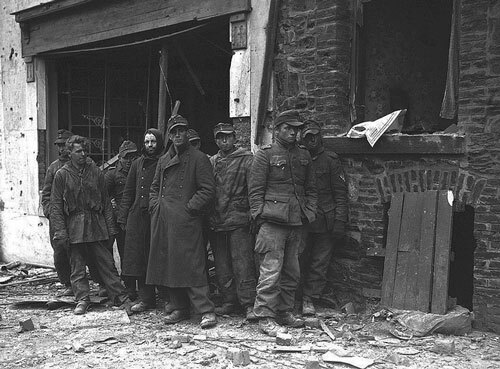 The remainder of the division, who were under constant artillery and fighter-bomber attacks, withdrew from Birkenfeld to the Rhine near Speyer on 25 March. By 27 March the remains of the division gathered at Kirchheim-Bonlanden. From there, the division moved south to Thalheim of Chemnitz, Saxony in mid-April 1945. Here they were committed to the front where they were eventually wiped out completely. 257. Volksgrenadierdivision was formed on 13 October 1944 by the renaming of the 587. Volksgrenadierdivision as a replacement for the 257. Infanteriedivision, which had been destroyed in Romania in August. In January 1945 the division moved to the Lower Alsace, and was deployed near Bitche for Operation Nordwind. They were to bust through the enemy lines before swinging west to take Lemberg from the west before clearing Goetzenbruck and Sarreinsberg. The division launched its assault on 1 January, but made little headway against the defending Americans of the 100th and 36th Infantry Division and Task Force Hudelson. By 20 January they had advanced just 2kms around Althorn. By mid-March 1945, the division had to join the German retreat to the Rhine and crossed it at Karlsruhe. In April 1945, following fighting at Nagold they withdrew to the Danube. In Munderkingen the division became trapped and was virtually destroyed. Remains of the division escaped to eventually surrender at Füssen, Bavaria. 272. Volksgrenadierdivision was formed from the remnants of the second line 272. Infanteriedivision after it was virtually wiped out at the Falaise Gap at the end of the battle for Normandy. They absorbed the 575. Volksgrenadierdivison and were appointed a new commander, Eastern Front veteran Oberst Georg Kosmalla. 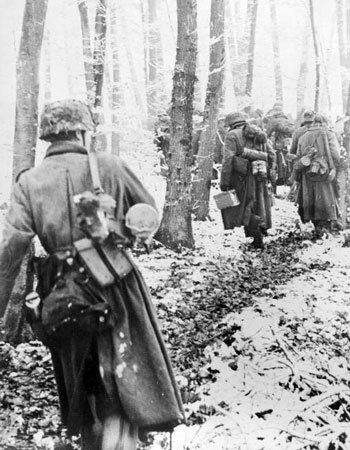 In November 1944 the division was engaged in the battle for Hürtgen Forest, which raged until the German Ardennes offensive forced the Americans to call off their attacks. During the Ardennes offensive 272. 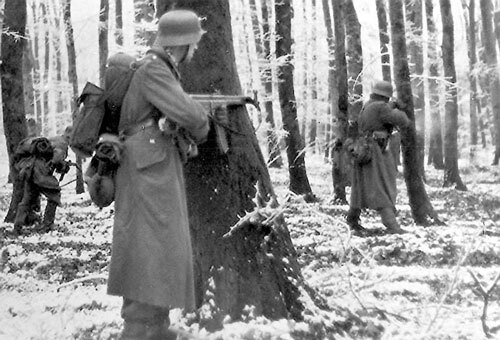 Volksgrenadierdivision only played a minor role as it had to hold its positions in the Hürtgen Forest and was mostly engaged in defensive actions with the US 78th Infantry Division at Kesternich. During the fighting Oberst Kosmalla was seriously wounded and Generalmajor Eugen König of 12. Volksgrenadierdivision took command. After the Ardennes the division was forced to retreat eastward as the Allies drove further into Germany. By February 1945 they had taken positions behind the Rhine River. Like many other German units they ended the war in the Ruhr Pocket. 276. Volksgrenadierdivision was formed from the 580. Volksgrenadierdivision and remnants of 276. Infanteriedivision that had been destroyed in the Falaise Pocket escaping from Normandy. 276. 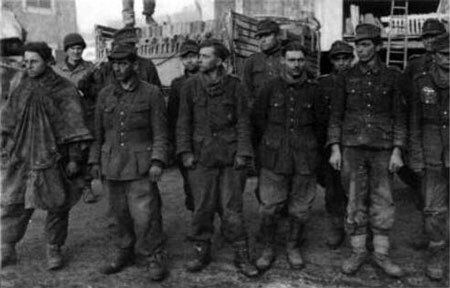 Infanteriedivision had been made up of older recruits from reserved occupations such as mining, and its first combat had been in Normandy taking over the positions of the 12. SS-Panzerdivision in July 1944. The morale of the unit was generally low, and many of the wounded were still recuperating. It was at full-strength, though it didn’t have any assault guns. During the Ardennes offensive they division was tasked with taking the villages of Beaufort and Eppeldorf, and the heights west of the Sauer River. It was also to take out the American artillery positions at Haller and to protect 352. Volksgrenadierdivision’s left flank. Acurate artillery slowed the division progress and attempts by pioneers to bridge the river for the artillery and other heavy equipment. However, a dressing down of the division’s commander, Generalmajor Kurt Möhring, by the Seventh Army commander General der Panzertruppen Erich Brandenberger, had an effect and on 17 December the division was more successful. They attacked at night and by dawn they had cut off three companies of the US 60th Armored Infantry Regiment. They made it to Beauford forcing the command of the 60th Armored Infantry Regiment to withdraw which in turn forced the artillery at Haller to also withdraw. On 18 December Möhring’s car was hit by a burst of machine-gun fire and he was killed. Oberst Hugo Dempwolff assumed command of the division. On the same day a relief force to extract the three companies of armored infantry on the banks of the Sauer was ambushed by the Volksgrenadiers and wiped out. The next day four StuGs finally arrived for the division and the artillery was brought across the river. The division took Weilerbach and Gentingen, and on 20 December Waldbillig was taken. However, the new faced all of Combat Command A of the 9th Armored Division and the newly arrived StuGs were lost. The division lost so many men when the American started their counter-offensive that they were attached to 79. Volksgrenadierdivision. The division was finally destroyed south of Remagen while retreating towards the Rhine in March 1945. At that point they had just 400 men. 277. Volksgrenadierdivision was created from the remnants of 277. Infanteriedivision during September and October 1944 after the original division had escaped through the Falaise Gap in August. It was sent to Hungary for training and reformation with a core of about 2500 veterans. Due to the battles in Eastern Hungary and pressures on the communication and supply routes most of the additional replacement personnel did not arrive until early October. These were mostly made up of the Croatians of the 574. Volksgrenadierdivision. The division began to relocate to the West on 30 October, but progress was slow. They finally replaced 347. Infanteriedivision on 10 November while the latter was relocated to the Alsace. They were initially deployed on the fortified West Wall between Wallerscheid and Losheim, but their front expanded as other units were drawn off to take part in the battles for the Huertgen Forest to the north. The sector proved to be quite. However, there were some doubts about the morale of some troops, especially Volksdeutsche (foreign ethnic Germans), Alsatians (who were assumed to hold French sympathies), and soldiers from the Vienna area currently under threat from the Soviets. Training for the Ardennes offensive began in early December, with the emphasis on forest and night fighting. The commander of the division, Oberst Wilheim Viebig, was also informed of the coming offensive and the role of his division. They were to punch through the defensive line of the Americans and allow the following panzer troops to push through. They were to take the villages of Rocherath and Krinkelt (the ‘twin villages’ as they became known in US accounts) and clear the Hollerath-Losheim road to Elsenborn for Kampfgruppe ‘Müller’ of 12. SS-Panzerdivision ‘Hitler Jugend’. The battle for Rocherath and Krinkelt proved so costly in both officers and men the division was unable to make further progress. The division took a secondary role as the 3. Panzergrenadierdivision arrived to continue the assault on the Elsenborn Ridge. By 20 December 277. 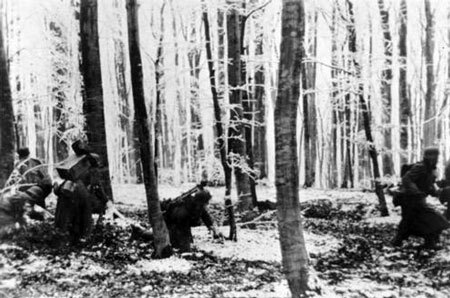 Volksgrenadierdivision had occupied the Kalterherberger Forest to the north where they took up defensive positions. After the Battle of the Bulge the division retreated eastwards and surrendered in the Ruhr Pocket in April 1945. 326. Volksgrenadierdivision was another division formed from a second line division that had been destroyed in France in 1944. It was rebuild in Hungary from the remnants of the 326. Infanteriedivision and the newly forming 579. Volksgrenadierdivision. Like it neighbour, 272. VGD, it was engaged in the battles for the Hürtgen Forest in November 1944 before being assigned to the Ardennes offensive. It managed to advance as far as Höfen before being pushed back in January 1945 to be south of St. Vith. In February it was engaged in heavy fighting as it retreated through the Schnee Eifel region. Eventually it retreated across the Rhine River, before it was finally captured in the Ruhr Pocket in April 1945. 340. Volksgrenadierdivision was formed from the remnants of the 340. Infanteriedivision, and the partially formed 572. 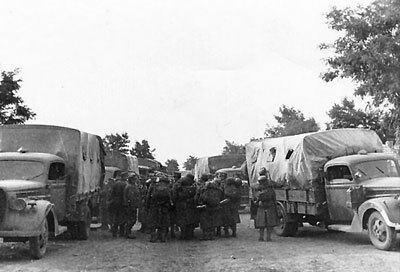 Grenadierdivision in September 1944. The 340. Infanteriedivision were veterans of the Eastern Front, fighting around Kharkov and during the retreat from Kursk in 1943. It was finally encircled at Lvov and destroyed. The new division was commanded by Oberst Theodor Tolsdorff, who was only 35 and had won The Knight’s Cross with Oakleaves and Swords. The division was still under-strength when it was committed to the fighting east of Aachen in November 1944. The division was sent south to take part in the Ardennes offensive. Due to fuel shortages it was still heading toward I SS-Panzerkorps when, on 1 January 1945, it was assigned to Kampfraum Bastogne (Battle Area Bastogne) with the 9. SS-Panzerdivision and 12. SS-Panzerdivision. The division had become Kampfgruppe Tolsdorff, as it no longer even approached the size of a division. The group’s attack ran into a pre-empted attack by the US 6th Armored Division from Bastogne towards Wardin and Margeret. A detachment of 340. Volksgrenadierdivision actually managed to break into Margeret. Unfortunately the Lufwaffe appeared in the skies above Margeret and proceeded to bomb it, causing more casualties among the Volksgrenadiers, than the US 68th Tank Battalion facing them. A few hours later the American tanks had retaken Margeret. Tolsdorff redirected his men towards Bizory on 3 January supported by Panzer IV/70 tank-hunters of the 12. SS-Panzerdivision. Here they clashed with the 501st Parachute Infantry Regiment, US 101st Airborne Division and pushed the paratroopers back about 500 meters. The attack by the three divisions continued until 6 January when they were forced to withdraw due to pressure further north. Kampfgruppe Tolsdorff was then transferred to replace 276. Volksgrenadierdivision in the LXXX Korps. They division continued to withdraw towards the southeast despite the kampfgruppe’s best efforts. During their retreat they eventually made contact with 19. 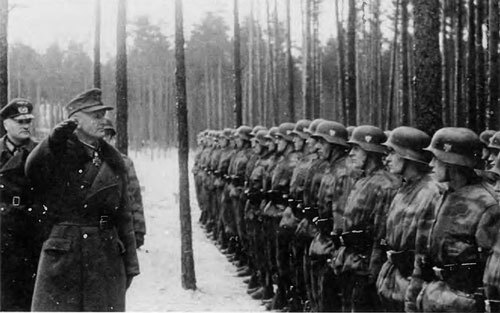 Volksgrenadierdivision in February. The division was incorporated into 19. Volksgrenadierdivision in March. 352. 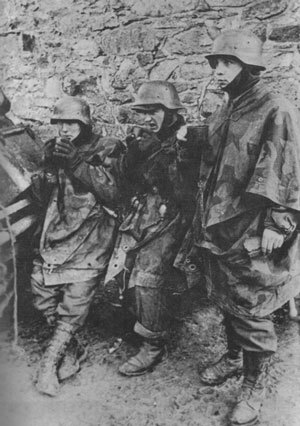 Infanteriedivision and 389. Infanteriedivision, and filled out with former Kriegsmarine personnel from 581. Grenadierdivision. It was commanded by Generalmajor Erich Schmidt. It was deployed for the Ardennes offensive between Vianden and Echternach flanked by the 276. Volksgrenadierdivision and 5. Fallschirmjagerdivision. The division was at almost full strength, but still only had six Hetzer tank-destroyers in its Panzerjagerabteilung (anti-tank battalion). The commander considered it fit for battle and morale was high. It initial progress was good, taking a number of villages along its front by 22 December 1944. However, Generalmajor Erich Schmidt was wounded while leading an assault at Diekirch. Command was taken over by Generalmajor Bazing. The US Third Army offensive to relive Bastogne began on 22 December and the US 80th Infantry Division hit caught the 915. Volksgrenadier Regiment, 352. Volksgrenadier-division, in the flank on the Ettelbruck-Pratz road. This forced the regiment to abandon much of its heavy equipment. Eventually the rest of the division was forced to withdraw and they went over to the defence. They eventually crossed the Rhine in March 1945, having been reduced to a single kampfgruppe. The division’s last battle was in April 1945 defending Nürnberg in Germany. 361. Volksgrenadierdivision was formed on 23 August 1944 a replacement for the destroyed 361. Infanteriedivision by the renaming 569. Volksgrenadierdivision. It was built around an experienced infantry cadre. It included mostly men from the Rhineland and Westphalia, many of them were reclassified Kreigsmarine sailors and Luftwaffe troops. 361. Volksgrenadierdivision was commanded by Generalmajor Alfred Philippi, a 41-year old infantryman from Austria who had won the Knight's Cross on the Eastern Front. After about five weeks of training, the division was deployed in Lorraine, fighting defensive and delaying actions against elements of the US Third Army. In November, they opposed the advance of the 44th Infantry Division near Sarrebourg, and in December, they grudgingly gave ground as they fought tenacious delaying actions from south to north through the Low Vosges. 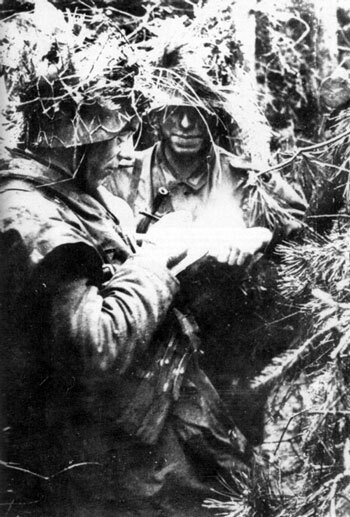 They soon became familiar with the terrain between Bitche and the German border during this fighting. They took part in Operation Nordwind in early January 1945, advancing successfully from their positions between Mouterhouse and Baerenthal as far as Wingen-sur-Moder and Reipertswiller by 4 January. However, strong counterattacks had pushed back from their farthest advance by 20 January. 553. Volksgrenadierdivision was created on 9 October 1944 by the renaming of the 553. Grenadierdivision in Lorraine. The 553. Grenadierdivision was originally formed as a Sperrdivision (blocking division) in Münsingen. The unit was composed of men from Württemberg. In September 1944, the 553rd was rushed to the Lorraine region of the western front and thrown into battle against the Allied troops advancing on the city of Nancy. During September 1120. Grenadierregiment of the division defended Forêt de Champenoux to cover the withdrawal of the rest of the division. The regiment had entrenched thoroughly, building a line of log-covered dugouts and foxholes ten or fifteen yards inside the forest. Within the shelter of the woods a few assault guns backed up the infantry and covered still more entrenchments. When the Americans attacked with tanks and infantry on 20 September, they were repulsed. Repeated attempts were made to push the 1120th Regiment out of their positions during the day, and the following day, but all were driven back. The Americans tried a prolonged artillery barrage to demolished the entrenchments, but even this was unable to dislodge the defenders. On 22 September, the Americans tried a combined attack with the 80th and 35th Infantry Divisions, supported by one combat command of the 6th Armored Division and the Volksgrenadiers were finally pushed out of the forest. With the Americans now threatening both his flanks, the 553. GD's commander, Oberst Erich Loehr pulled his division back. The division was pulled out of the line in October. The whole 553. Grenadierdivision had been worn down after a month’s hard fighting and had to be reinforced. The reinforcements it intergrated were number of fortress and independent battalions in the area of Army Group D. Even with the addition of these groups, one regiment (the 1121st) was dissolved along with the 2nd Battalion of 1120. Grenadierregiment. While the US Third Army was advancing from Metz, the US Seventh Army was preparing to clear the Saverne Gap. In mid-November, the American 44th Infantry and the French 2nd Armoured Divisions started an advance aimed at taking Saarbourg. Among the defending units was the newly renamed 553. Volksgrenadierdivision. Another hard defensive battle began for the Volksgrenadiers. The Allied assaults ground down the German units until they were only shadows of their normal organizations. After Saarbourg fell to the US 44th Infantry Division on 21 November, the remnants of 553. VGD were pulled out and transferred to southern Alsace. During Operation Nordwind the division the division attacked alongside 10. SS-Panzerdivision from Gambsheim towards Haguenau. At the end of January, the High Command decided to pull the 553. VGD out of the line entirely and rebuild it once again. The division was re-established on 31 January 1945 in Pforzheim. The division was deployed in the 19. Armee sector on 20 March. The division surrendered to the Americans shortly thereafter in Württemberg. After forming, 559. Volksgrenadierdivision was sent to Thionville (Diedenhofen) and Metz in France in September 1944 for offensive operations. It fought the Americans at Moerchingen, Saint-Avoid, Salzburgen, Dieuze, Delme, and in late 1944 was heavily engaged in the Saar area and in northern Alsace. During Operation Nordwind it was deployed around Bitche facing the US 100th Infantry Division. The offensive was launched on 1 January, their furthest advance flanked Lemberg on 4 January, but by 20 January they had been pushed back. However, they still held some of their gains. In January it absorbed the remnants of 361. VGD and continued to fight in the West Wall battles. It fought in the Saar (January), Saarbrucken (February) and Mosel (March). In late March the division was in the southern sector of the western front when it was cut off and largely destroyed on the western bank of the Rhine. The remnants of the division surrendered to the Americans near Muensingen in May 1945. Formed as part of Himmler’s ‘Replacement Army’ in August 1944, 560. Volksgrenadierdivision obtained its personnel from various Luftwaffe and Heer units stationed around Norway and Denmark. They all came together at Moss, in Northern Norway, and were ready to be sent to the front in October 1944. It was committed to the Ardennes on 16 December 1944, but was under-strength due to many of its personnel being still on route from Norway. Each regiment could only field about a battalion in the field and it lacked its assault guns. Even its commander was in hospital for the first 10 days of the battle and the division was commanded by one of its regimental commanders, Oberst Rudolf Langhaüser. Langhaüser, on the return of the commander Generalmajor Rudolf Bader, must have proved himself because he took over command of 12. 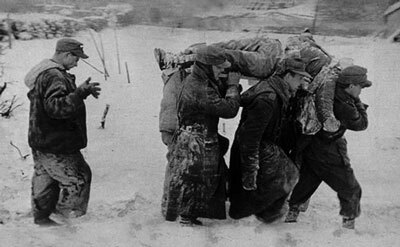 Volksgrenadierdivision on 26 December after its commander, Gerhaed Engel, had been wounded fighting on the Elsenborn ridge. During his command of 560. VGD, Langhaüser had led them with skill and determination breaking through the lines of the US 28th Infantry Division’s 110th and 112th Regiments at Sevenig and Heinerscheid. They had reached Houffalize before encountering stiffening resistance west of St. Vith. They eventually were forced back to Houffalize. The US counter offensive hit them on 3 January 1945 and they continued to fighting around the St. Vith sector, with more of their men finally arriving from Norway. They fought at Echternach in February, before falling back over the river Pruem. Langhaüser, who had rejoined the division, commanded the survivors in the Ruhr Pocket before they went into captivity with its surrender in April 1945. The division was formed on 4 September 1944 in Slovakia as a replacement for the destroyed 708. Infanteriedivision by the renaming of 573. Volksgrenadierdivision. After two months of forming and training, the division was sent to the western front as part of the LXIV Army Corps, with Oberstleutnant Johannes Marahrens taking over as commanding officer in January. On 21 January 1945 it aborbed a number of fortress and independent battalions. They deployed near Colmar, in what would become the Colmar Pocket facing the US 3rd Infantry Division and the French 1st March Infantry Division. The US 3rd Infantry Division attacked 708.. Volksgrenadierdivision’s positions on 22 Janaury 1945, aiming to cross the Ill River, bypass Colmar to the north, and open a path for the tanks of the French 5th Armored Division to cut German supplies. A counterattack by 708. Volksgrenadierdivision and supporting assault guns at Maison Rouge was able to push the Americans back after the Americans were not able to move their tanks across weak bridge. There they kept the Americans pinned on the other side of the Ill River for three days. The Americans attacked again on 25 January and recaptured the broken bridge at Maison Rouge. The Volksgrenadiers counterattacked again, but the Americans were able to establish themselves across the river. The Americans continued to make progress, all the while 708. Volksgrenadierdivision launched counterattacks to try and hold them back. To the north the division was also able to hold off the Frenchmen of the 1st March Infantry Division. The Franco-american forces eventually cut off the pocket. The German 19. Armee, although not completely destroyed, lost the bulk of its experienced combat troops with only 708. Volksgrenadierdivision escaping somewhat intact. However, the division’s units were incorporated into other units. 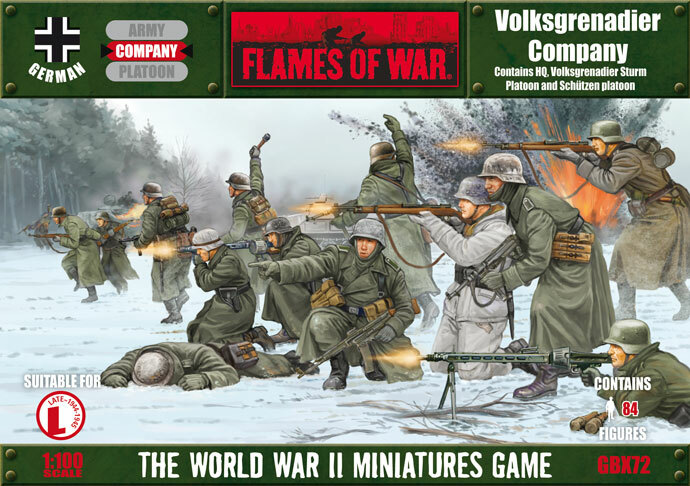 I hope that helps you select a Volksgrenadierdivision on which to base your Flames Of War Volksgrenadierkompanie.